I've never done this before, but what the hell. 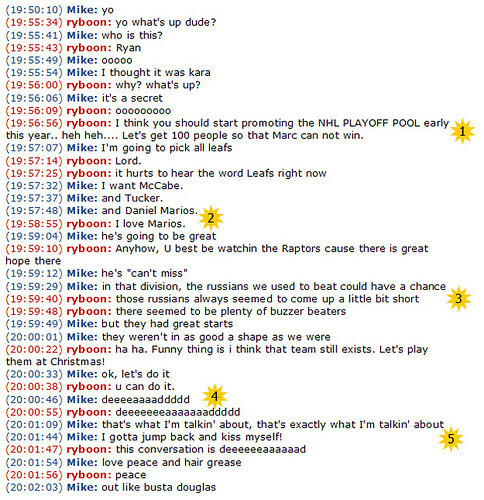 My brother Ryan and I just had a seven minute chat via IM and I thought I'd share it. During an uneventful seven minute exchange I counted five references nobody else would get. Well, maybe Steve would get a few of them, but otherwise it really was a targeted convo. Here's the complete chat and an explanation of these five references. 1. We love our annual playoff pool, but we're sick of Marc winning every year. We don't know how he does it, because he's not the sharpest tool in the shed and he hardly knows hockey, but he consistently wins or places second. He won in 2006 and 2004. If you can beat him, you're welcome to join in the fun next spring. 2. When Daniel Marois scored 31 goals in 88-89, our expectations were lofty. I wrote about him last year. He was going to be the next Sittler, but instead he was a bust. 3. My two brothers and I frequently played basketball against the Russians. Us three were teammates on Team Canada and we were taking on those damn Russkies for basketball glory. The Russians always got off to a huge lead before we came back. There was play by play, buzzer beaters and miraculous comebacks galore. We never lost to those Russians, but they always put up a fight. 4. For a while in the early 90s, Ryan and I used to say "Deeeeeaaaaaddddd" to each other in a voice that doesn't translate well to print. It was sung tauntingly and it became a thing that we did. We bring it back every so often, retro style. 5. Big Daddy Kane's Taste of Chocolate was a disc I enjoyed back in 1990. The guy had this ultra smooth rhyming style and dropped lines like "I gotta jump back and kiss myself" and "love, peace and hair grease". These lines found there way into my vernacular.